Google reveals a new phone: "The G1"
But will it have a radio? The first cell phone running Google Inc.’s mobile software looks something like Apple Inc.’s iPhone and has a large touch screen, but it also packs a trackball, a slide-out keyboard and easy access to Google’s e-mail and mapping programs. Google made its debut as a cell phone software provider at an event where wireless carrier T-Mobile said it will begin selling the G1 phone for $179 with a two-year contract. The device hits U.S. stores Oct. 22 and heads to Britain in November and other European countries early next year. The phone will be sold in T-Mobile stores only in the U.S. cities where the company has rolled out its faster, third-generation wireless data network. 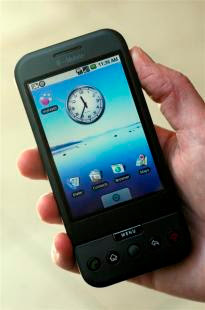 The Google phone, like Apple’s iPhone, features a touchscreen and can run a variety of open source applications.